Face primers and setting sprays are very essential for a summer bride. Even if you do not struggle with foundation and other face makeup breaking down on you normally, you will still want to make sure these steps are part of your wedding day makeup. Between sweating, the humidity (at least for those of us in the South), and oil from your face, brides getting married in those hot months need all the help they can get. To start with, face primers go on after your moisturizer and before any face makeup. However, there are many different primers with many different purposes. There are primers to reduce the look of pores, to make your makeup glide more easily on to the skin, to improve the longevity of foundation, to reduce oil, to calm red skin, and so on. For me, as a gal with extremely oily skin, I wanted something that would help my foundation last long while keeping me matte. 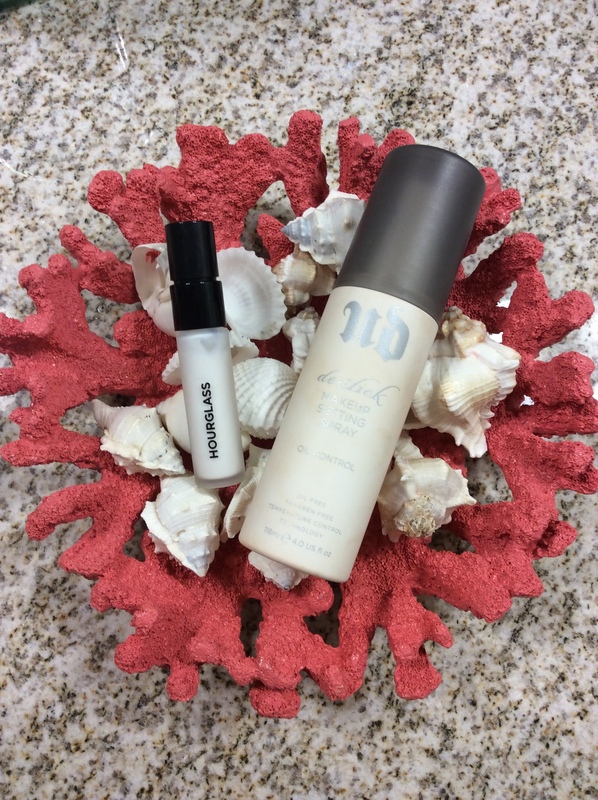 Girls with dry skin, since they do not have the same struggle that I do, may want a primer that helps the foundation apply better on the skin, but still improves the wear of their makeup. This is something that you will need to decide first before going out to purchase one. For those wanting a smoother canvas to apply their makeup, go for a silicone-based primer (here is the article again helping you find out what type your foundation and primer is). On my skin though, silicone-based primers cause my face makeup to just glide right off. I tend to go for mineral- or water-based primers, as they are more mattifying (or at least the ones I have tried). As pictured above, and yes I am horrible with taking photos, I LOVE Hourglass Veil Mineral Primer. I bought the smaller size because I rarely use primer. Unless it’s a special occasion or I need my foundation to look perfect all day, I really do not see the need to add another product to my foundation routine. This primer is just amazing though! It greatly improves the longevity of whatever foundation I am wearing while calming down some of my redness. While there is a sunscreen in it, the ingredients that provide the SPF are chemical not physical, and therefore do not cause flashback. Even though I loved my primer I already had, I thought that for my wedding I would test a few other primers. Of course I had to try the Smashbox ones! They are a cult classic after all! I ended up getting either the sample sizes or actual samples of the regular, light version, and the green-toned version. These all have silicone in them and just did not do well with my skin type. The green-toned one helped reduce the redness in my face but that was the only benefit for me. I would, as previously mentioned, suggest these primers for brides with normal to dry skin. I also tried the Becca Ever-Matte primer. I had heard great things about this primer and the name was ever so intriguing to me. Sadly, I really did not like this one either! It was definitely mattifying, but it was so difficult to blend on to my skin! It was so weird. I understand that silicone is the ingredient that improves a product’s blend-ability but I just could not make this work for me. It ended up causing my foundation to pill up when I applied it, which is NOT a look I want for my wedding. So for those with combination to oily skin, I would steer them towards the Hourglass one. Finally, you will want to set all your makeup with a setting spray. The one I have loved for years is Urban Decay De-Slick Oil-Control Setting Spray (the one pictured where you cannot see the name, yeah that’s the one). This amazing product is what I will use on my wedding day since it is great at controlling oil. For normal skin to combination, I suggest using their All-Nighter Long-Lasting Setting Spray. Girls with dry skin, IMO, could get away without a long-lasting or oil-controlling setting spray. If you really would still like to set your makeup, I would say try MAC Fix+ spray. It is such a nice product and gets rid of that powdery look. With all the great ingredients in it, it will bring a healthy look to your skin. Hope these tips have helped and as always test these products out well in advance!